As you may know, I’m a Birchbox subscriber since November 2014 -until November 2015. After a good experience with my first box, I’ve decided to share my « Birchbox year » on my blog, every month. That’s why I’m here today! Watch the unboxing video right here on my Youtube Channel! This month, Birchbox has decided to make their subscribers perfect for Christmas and the New Year’s Party. As usual, little notes are here to explain every little product’s secrets. 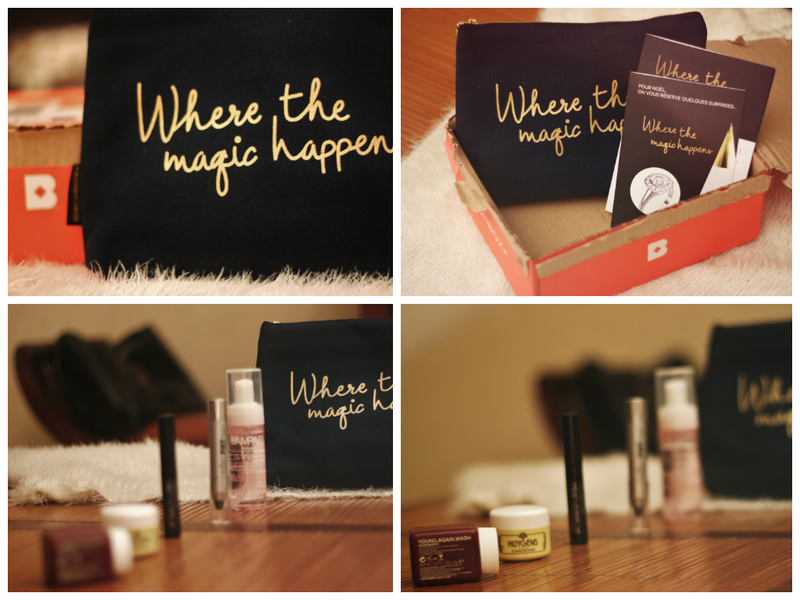 Surprise, this time all products are hidden inside a cute bag saying « Where The Magic Happens« . Pretty cool to keep and recycle into a make-up bag! Well, enough babbling, it’s now time to talk about the products themselves! First one, is a french one (Yay, Cocorico!) and it’s a face scrub from Huygens. First of all, the smell is A-mazing! It’s all about rice, sesame and green tea. – Who doesn’t love a face product with green tea? 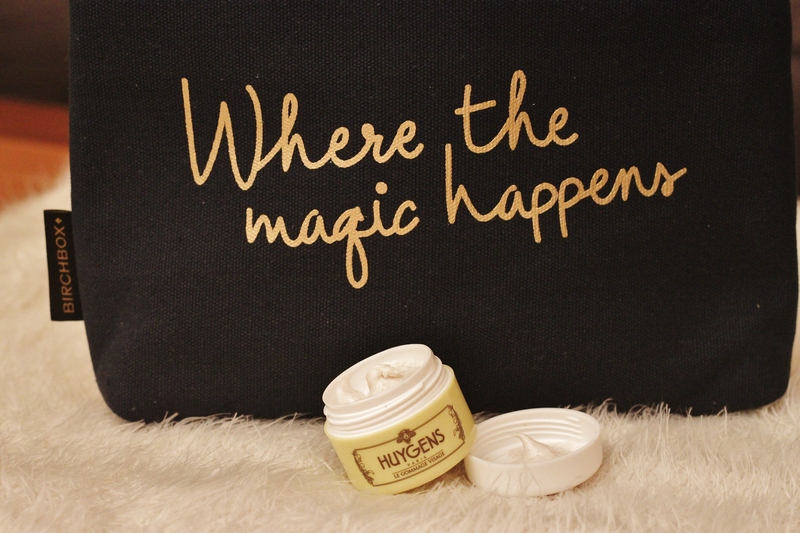 It feels so fresh on the skin and it’s pretty gentle, well played Huygens. Oh, and by the way, it’s all about bio and natural ingredients… How could you ask for more? Face is ready, now what about hair? 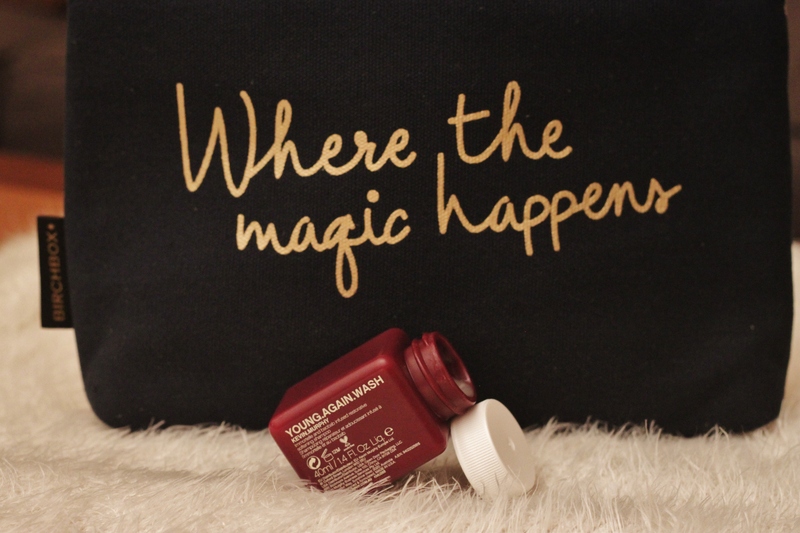 The second product is a Kevin Murphy shampoo, « Young.Again.Wash« . As previously said, the smell is awesome. It’s not too much and I like the fact that the hair keep a little bit of the scent when it dries. More, it keeps the hair soft, shiny and nourished. Immortelle and baobab seems to be a pretty nice mix! Ok, now that your hair is perfect, (and so is your skin), it’s time for MAKE-UP! Eye make-up to be honest because inside the box it’s not one but two eye products. 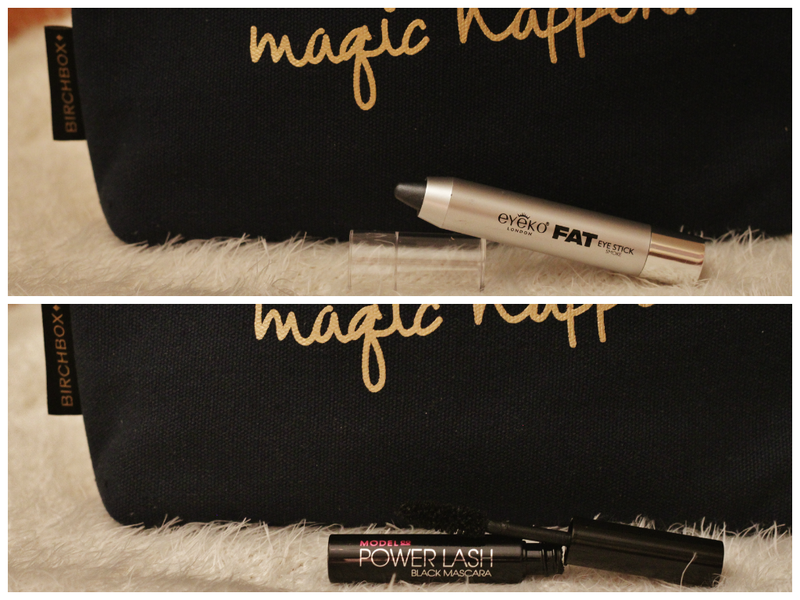 One is the Power Lash Black Mascara from ModelCo Cosmetics, the other is the Fat Eye Stick in Smoke by Eyeko London. These two, together, are wonders. Finally, when the day is over it’s time to wash everything off and you know what? Birchbox is ready for that too! The last product of the box is a make-up remover. More, it’s a dry cleanser, perfect for lazy girls like myself. No water, no towel, no lost of time. Take a cotton pad, clean all of your face (eyes, lips… yep, everything) and you’re done! 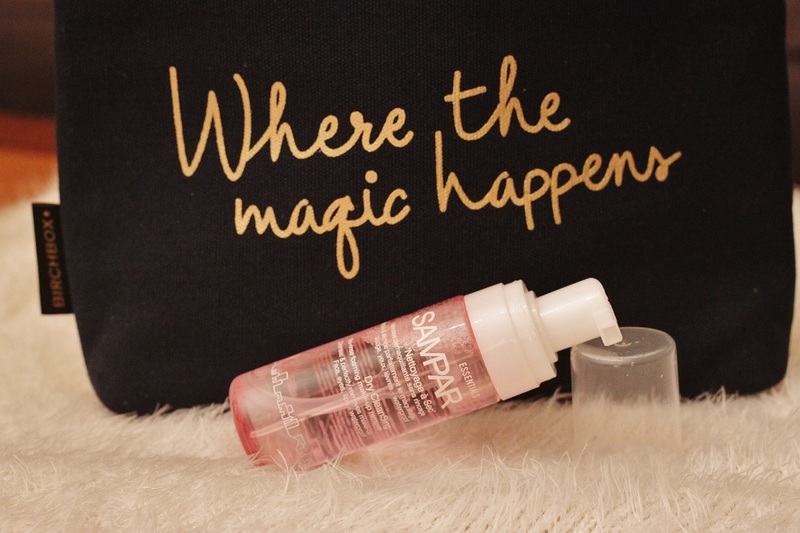 Oh, and because it was not enough, the Sampar Essentials Dry CleanSing is also perfect to take off waterproof stuff. Did I mention it’s cute pink color? Nope ? Then now you know! Let me know what is your favorite product in the comment, I would love to know because I can’t choose only one! Wanna watch the unboxing video? It’s live here on my Youtube Channel! Do you already know Birchbox?